The wind was strong yesterday, no blue sky at noon. A crock pot wrapped in foil cooked plump turkey thighs in a soup with chunks of celery, sweet potato and onions. Standing outside earlier in the morning while Lono and Kane gathered the weather for the day, I collected the whole canoe shaped root, the long stalks of green celery, and the round onion wrapped in its own beautiful brown-skins. The sweet potato and celery needed to be washed and drained. The onion, unwrapped, was clean as it unfolded. With everything prepared I swiped my favorite knife over the stone to sharpen it. Within a few minutes all the vegetables were ready for the pot. The turkey who had given up his or her life for us I unwrapped from its sterile casement. From the glass jar I hope the dried cooking herbs (bulk Italian Seasoning) came a generous sprinkling. Ginger root, the final gift, was grated. Making sure there was plenty of water to stew the meal I set the pot with its lid, and had Pete wrap the whole thing in heavy aluminum fold. Turned to HIGH, in a few hours the wrapped pot, secured with string against the whipping winds provided hot food to eat. "That full moon will tightly conjunct Chiron (in 10th House) which aspects a reciprocal stellium square. That means, the Full Moon will intensify my Scorpio stellium square with Saturn-Mars-Pluto in Leo with Jupiter transiting that trio (7th and 8th Houses).I have begun building a new school focused on Indigenous Practices. The protocol and ground rules are important (8th House legacy). My public reputation (10th House) and the deep wounds of Chiron (The Who am I to do this work?) are lit up. I’m old, challenged by health issues, determined to do the right thing(s). Jupiter could be the “luck” to build on solid ground. Thanks for the foresight, Elsa. Always a blessing to know how deep’s the water especially being a Scorpio." Today the skies are clear. Hummingbird has been at her breakfast gathering for hours; I watched her through the window when the sun had barely brightened. The rain overnight has soaked the forest with its blessed wet, we will not need to carry water out to the new fir recently transplanted. The crock pot of turkey and vegetable soup is feeding us: an early supper, a bit more before dark, and then breakfast today. The investment of time, and energy and maintaining an old appliance = food for a time. I'm sorting through the lessons and new starts that present themselves, as gifts and challenges, this spring. The language and cultural lessons that Lushootseed offers me tests my willingness to be open to be taught. My comfort with the different ways of using my mouth, and throat to make their sounds challenge my boundaries. Living with fewer teeth now I recognize how facility with words change for more than one reason. We age, organically for the most part. This lifestyle if it is accurate to describe it that way is mostly organic for a contemporary human. We shelter ourselves in tiny enclosures made from manufactured materials. Thanks to the accumulated knowledge and applied skills of a working man with fifty years of know-how, solutions and adaptations are unique to us. Turning my small garden space into a bathroom will be a creative enterprise, most of our shelters are. Being led, and heeding the guidance to inch our wheeled sleeping house into the woods six years ago has the organic continuation of life beginning again. The simple, and powerful three-word affirmation that leads this post comes from Robert Moss, he-who-teaches-how-to-dream. I needed that prayer this morning. Sometimes I will tangle myself in the complexity of believing I must have all answers at once. But that is a childish desire, selfish only because I had little experience with the long time. When I forget that the raging pollens are not personally assaulting me, I rage against Nature. And that? That is the fuel on the economy of consumption. The belief I could, and Must, be in control. Having this space on the pages of the blog, makua o'o ... maturing adult, is also the woman who hears when familiar words (o'o) are used in different context. The pronunciation is different, the extended meaning (kaona) wishes to feed me differently. While researching (searching again) I listened to the botanist, teacher, writer Robin Kimmerer. She speaks of the lessons of rice, and remembers for us, the steps of The Honorable Harvest. "When you get to the woods,[...] we are taught never take the first plant that you see, and that means you'll never take the last. And then if we encounter another plant we ask permission ... If you are going to take a life, you have to be personally accountable for it...It's just good manners...It's a two-way conversation though. If you're going to ask, you're going to have to listen for the answer...If the answer is 'NO' you go home. And taking without permission is also known as stealing. " At 16:21 (the time on the YouTube presentation) Kimmerer speaks the protocol of taking from Nature in a way that will do the least harm or benefit the plant, "Don't use a shovel when a digging stick will do." Put into the pot of my daily researching, openness to my life unfolding new, I heard that protocol to mean something for me as a maturing woman, ripening even as I hibernate in my space while the Scotch Broom (invasive species!) blossoms rage in pollination. I hear that the two sides of a makua o'o include the maturing one, who also, carries an o'o (pronounced with hard o's or accentuation on both vowels). Turing the maturing one into one who carries a digging stick. There is the lesson of a multi-faceted and organic life. Human, searcher, re-searcher, old and maturing, composting like a cedar stump making a place for new growth. 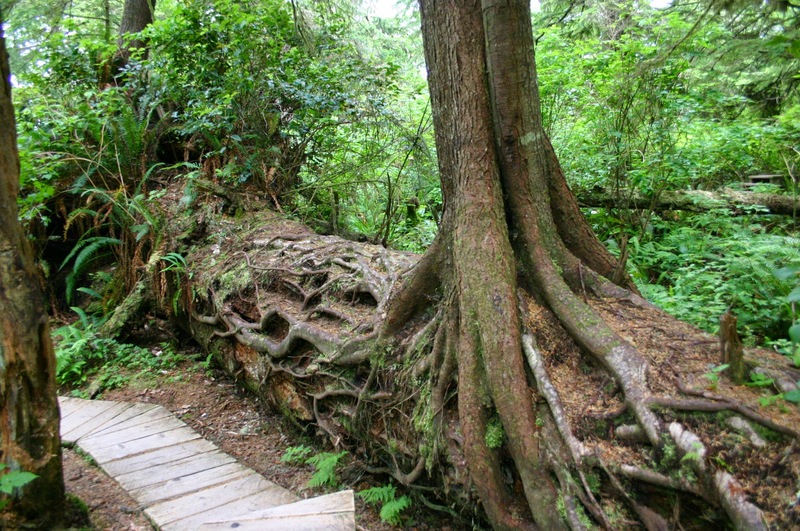 Old hemlock, old cedar and old woman can and do grow again. The lessons of rice from the Potawatomi are the same as my kupuna teach. We are taught to malama (care for) 'aina (the Earth), and in so doing, she will care for us. Indigenous wisdom have roots that touch. I am grateful for my life that is willing to reach out, ask permission, listen, give thanks and use the o'o. This is some kinda moon! Let there be light ... oh, wait! Remember the Chinese Finger Trap Game?